Billionaire investor Wilbur Ross is President-elect Donald Trump's pick for Commerce secretary, two sources tell CNN. The nomination is expected to be rolled out as part of an economic team announcement on Wednesday, when Trump will likely name Steven Mnuchin as treasury secretary. The Cabinet-level position, which requires Senate confirmation, serves as the government's chief business advocate. The Commerce secretary is a liaison between companies and the White House. Ross could play a key role in what are expected to be Trump's signature economic policy issues like trade and jobs. 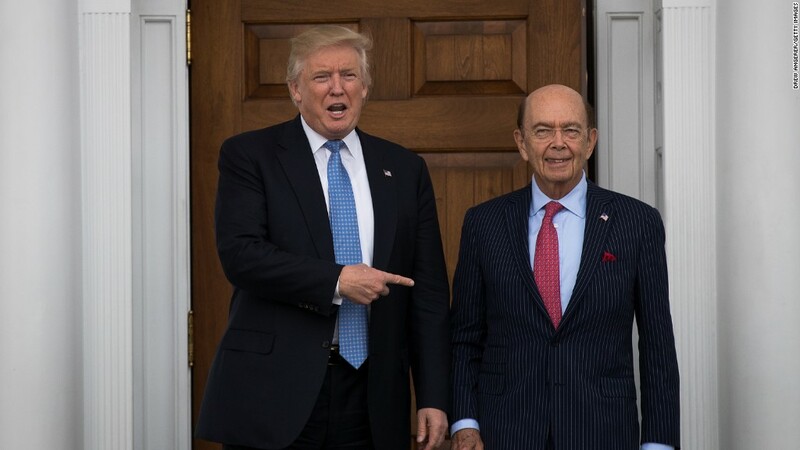 Ross, 79, fits the type of administration official Trump pledged to appoint during the campaign: businessmen with long resumes at the ready to negotiate for U.S. interests around the world. As a vocal Trump supporter before the election, Ross cited the need for a "more radical, new approach to government" that would help middle class and lower middle class Americans. Ross, chairman of WL Ross & Co., has made a career of resurrecting dying companies. Fittingly, some of Ross's biggest hits have been in the same demoralized industries that Trump wants to revive: steel and coal. For instance, Ross's firm scored huge returns last decade by cobbling together bankrupt steel makers including Bethlehem Steel to form International Steel Group. Ross then flipped the conglomerate in a $4.5 billion sale two years later. Ross's foray into the coal industry, however, ran into trouble in January 2006 when 12 miners were killed after an explosion at the Sago Mine in West Virginia. His company, the International Coal Group, had taken over the mine a couple months earlier. According to federal reports, the mine had recorded 96 safety violations in 2005 that were deemed "serious and substantial." The mine was fined nearly $134,000, an amount later reduced in court. Ross, a New Jersey native, has amassed a fortune that Forbes estimates is worth nearly $3 billion. He's used some of that money to build an impressive art collection worth a reported $150 million. In addition to chairing his equity fund, Ross also sits on a number of boards of directors, including for the Bank of Cyprus, where he is vice chairman; Arcelor Mittal, a steel giant; Sun Bancorp, a bank holding compnay; and Exco Resources, a natural gas and oil exploration company. Like Trump, who famously called himself the "king of debt," Ross is not afraid to borrow money. Ross frequently used debt to finance his acquisitions, a tactic known as a leveraged buyout. Carl Icahn, another billionaire backer of Trump, said on Twitter before the announcement that Ross is one of the "smartest people I know" and would be a "great" choice to lead the Commerce Department. 1/2 Spoke to @realDonaldTrump. Steve Mnuchin and Wilbur Ross are being considered for Treasury and Commerce. Both would be great choices. 2/2 Both are good friends of mine but, more importantly, they are two of the smartest people I know. Should Ross be confirmed, he would take over for Penny Pritzker, who has held the job under President Obama since 2013. And his policies would likely represent a 180-degree departure from Pritzker's Commerce Department. Pritzker strongly supported free trade and has traveled to 38 countries during her tenure. She advocated clean energy partnerships and the Trans Pacific Partnership trade deal, both of which Donald Trump campaigned hard against. Ross has been a vocal critic of free trade deals. "Free trade is like free lunch: There is no free lunch," Ross told Fox Business in August. "Somebody wins and somebody loses. And unfortunately, we've been losing with these stupid agreements that we've made." The Commerce Department includes the International Trade Administration, which enforces the nation's trade agreements. Whoever is chosen as commerce secretary will likely continue many of the policies that Pritzker and the Obama administration held dear. Pritzker supported public-private partnerships to build up American manufacturing industries. Many businesses -- notably For (F)-- have recently opted to keep some of their plants open in the United States as a result of those initiatives. Other important agencies fall under the Commerce Department, including the National Weather Service, the U.S. Patent and Trademark Office and the Bureau of Economic Analysis, the agency that tracks economic growth, the trade surplus or deficit and other important economic measures. The new secretary will also oversee the 2020 national census. The census is critical for understanding the scope of poverty and underserved communities across the country. It is also the basis for adjusting the number of congressional districts in each state, which determines presidential electoral votes. --CNNMoney's Jill Disis and David Goldman contributed to this story.